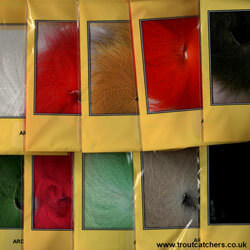 Arctic Fox 3X long, specially selected and the very longest arctic fox tail hair for big flies. Very soft and lively, perfect for streamer patterns where you would use fur wings, including, Salmon, Steelhead and Saltwater Patterns. Arctic Fox 3X colour choice: Black, Blue, Orange, Red, Yellow, Green, Brown. Arctic Fox Tail Piece - A most versatile hair in pure colours for winging or dubbing. 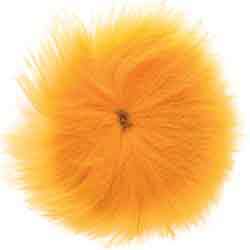 These Arctic Fox tail piece's combine very fine under hair with coarse guard hair.